My research is on the interface between applied mathematics numerical methods scientific computing an biology. We use theoretical tools to try to get a better understanding of organ and tissue development and disease. 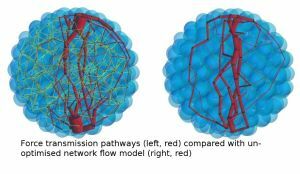 Due to recent increases in the amount and quality of cell level imaging data, and matching advances in computational power, multicellular modelling has become ever more popular. Multicellular modelling considers cells as discrete entities and represents their interactions using mathematical formalisms, both stochastic and mechanics based. This allows tissues to be simulated, with tissue level behaviour and properties being emergent rather than imposed. Various projects are available focussing on modelling and on numerical methods. See www.jmosborne.com for examples of my work. Colorectal cancer (CRC) is one of the major causes of death in the developed world. CRC arises when the cells lining the gut (which consist of millions of distinct test tube shape domains called crypts) undergo a string of mutations causing them to no longer respond to the usual control mechanisms. Possible treatments attempt to restore these control mechanisms by providing drugs, which change how cells respond to stimuli. The aim of this work is to use mathematical and computational modeling, in particular multicellular modelling where we represent each cell in the crypt as an interacting entity as shown in the figures, in order to investigate how these possible treatments affect the development of CRC. There are multiple possible projects available in this area and the project can be tailored based on the student's interests and background. As organs develop stresses are exerted on the cells and tissues within them. Cells adjust to these stresses by rearranging their internal components causing the tissues to effectively remodel. The processes involved in tissue growth can be modelled by a continuum approach (i.e. PDEs: Solid/Fluid mechanics) or a discrete approach (where each cell’s mechanical properties are considered). Current discrete multicellular models for tissue growth do not take into account the processes of cellular remodelling and are unable to reproduce experimental data on stress responses. Recently we have developed a new approach where the discrete model of cell interactions is coupled to an evolving reference frame. This new model allows the unstressed state to the cells to evolve over time leading to tissue remodelling. The aim of this project is to utilise this new model in applications in both development and disease. Our group has developed a novel, robust and efficient method of studying electromagnetic scattering phenomenon. There is an opportunity for a student with strong background and interest in differential equations, vector calculus, special functions and methods in mathematical physics as well a knowledge of electrodynamics to help implement the efficient evaluation of analytical benchmark results. Experience with using Mathematica or Matlab or interest in learning to use such computational tools will be an advantage. This is a well structured project with the opportunity to work in a team in Mathematics and Engineering to help validate computation results. The work program can extend to undertaking more complex calculations using boundary integral methods. Motile cells in living tissue need to remodel the extracellular matrix that surrounds them in order to be able to migrate effectively. A simple analogue of this problem is a random walker who changes the boundary geometry of the domain in which it walks on some if its collisions with the boundary. There are opportunities for both analytical work and computer simulations for problems of this type. Granular materials (e.g., mineral ores, powders, colloidal polymers, wheat grains) are ubiquitous in nature, and play a large role in several major industries in Australia (e.g., mining, chemical manufacturing, agricultural and food processing). The transmission of force through these materials is key to a full understanding of the rich and complex behaviours observed. While force information is trivial to obtain and study in numerical simulations, it has proven far more difficult to extract from real-world experiments. Graph and Network Theory, combined with Vector Calculus concepts, may hold the answer to this challenge (see figure), and will form the basis of this project, undertaken in collaboration with Université Joseph Fourier (France), Duke Univ. and Univ. Tennessee-Knoxville (USA).